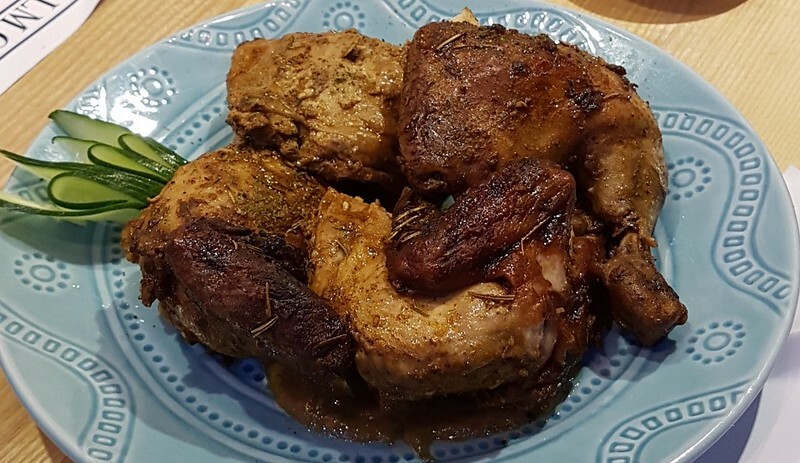 You may have heard of or tasted the wonderfully prepared chicken dishes of Palm Grill located at the corner of the bustling Tomas Morato and Scout. Castor streets in Quezon City. Their logo even gives it away as a chicken made up of, you guessed right, palm leaves, hence the name of the eclectic yet inviting restaurant. This joint is fairly new in the strip as it only opened 4 months ago but has attracted families and millennial barkadas alike. Don’t let this newcomer give you any doubts because it has created a following for its TDF (to die for!) chicken dishes, namely, the Green Chicken (Malay-inspired with coconut toasted coconut, and spices akin to curry), Labuyo Chicken (spicy chicken wings), Oswalda’s Fried (mildly sweet and oh so crunchy), and Olympus Roast (harmonious blend of sweet and savory). 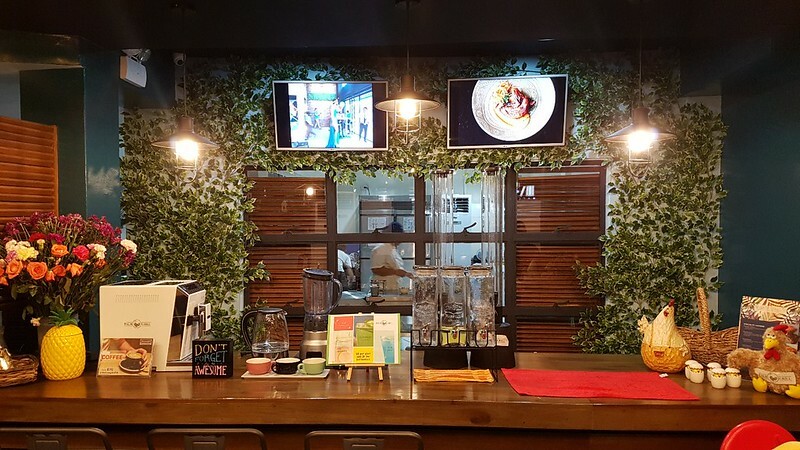 Co-owner Miguel ”Miggy” Moreno, who is deeply rooted in his southern Chavacano heritage, further expands the restaurant’s Tausug and Zamboangeño-inspired menu by offering the best seafood from that region of the Philippines. 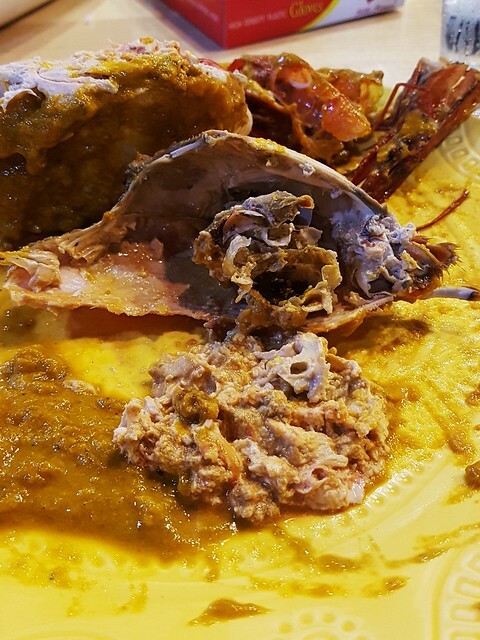 We have been to Zamboanga and one of the most memorable dishes we have eaten from Mindanao has to be the curacha (spanner crabs) in a special crab fat and coconut cream sauce from a famous restaurant in the city (yes, the one which starts with the letter “A”.) So our faces lit up when we learned that the highlight of their new menu will have curacha prepared in a similar fashion to that famous dish at “A” but with a Palm Grill twist! And there it was, 2 handsome spanner crabs, split in half smothered with their Zamboangeña sauce beside a platter of steamed white rice. Plastic gloves were provided but seeing how big and meaty the curacha was, it was so easy for us to decently pick the succulent meat with a fork and a knife. Other people at the table went in with their hands donning the gloves—no judgment! But everyone did the same thing; smother their crabs and rice with more of the golden sauce and for a very good reason. 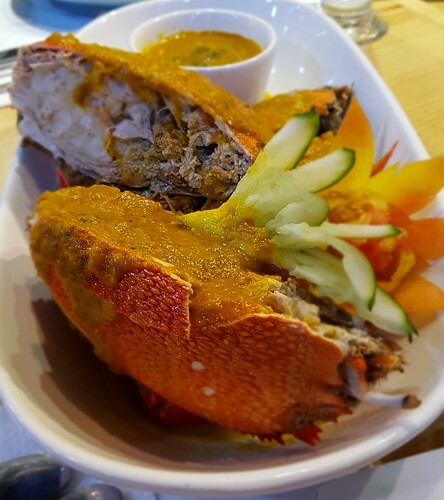 The luscious gravy was good in itself as it enhanced the sweetness of the crab with a mild briny zing to every bite. Miggy told us that you get a second ramekin of that sauce for free, and we say take that advantage when you dine here before they start bottling it up and charging you extra for it. Believe us too when we say, at PHP 650 per order, this is such a steal! Unlike other seafood restaurants which charge you the market price of crabs, they have a standard price scheme which, if we remember correctly is even cheaper than the restaurant in Zamboanga. What also amazes us is that the crabs are shipped fresh from a sustainable curacha farm directly from Zamboanga. With that shipment also comes some giant tiger prawns which is simply boiled in herbs and spices like the crabs and drowned in more of this wicked sauce. Don’t be fooled when we say simple because flavors will definitely tickle your tastebuds. A second dish of white shrimp on metal kebab skewers with distinctive char marks leaves an even more distinct taste on the palate. Though smaller than the prawns, these shrimps pack an even bigger punch! The grill has given the dish a smoky and earthy character which in itself is delicious. But the magic happens when you dip it in that mother of all sauces! 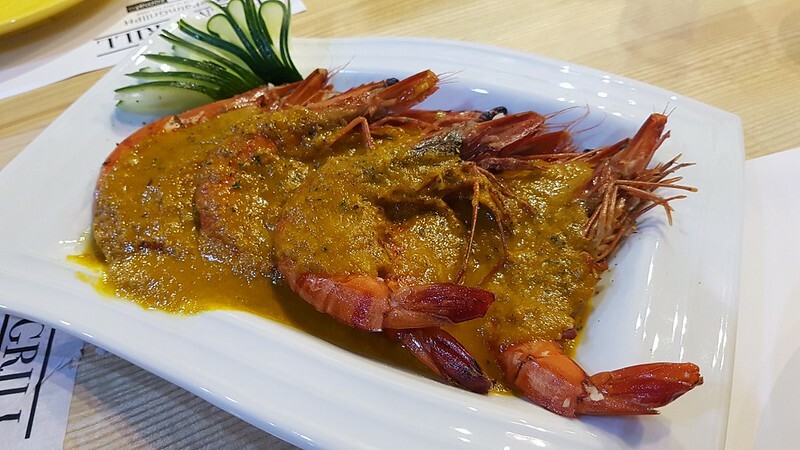 This dish is served with some vinegar but in case you don’t order the curacha or prawns (which you should! 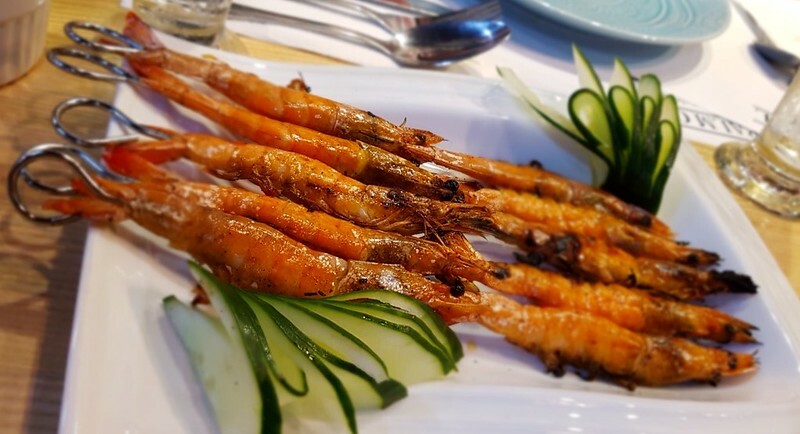 ), then you should get these grilled shrimps with a side order of the Zamboangeña sauce. So much crab fat in one curacha. Really a luxurious treat! One regret we have is not asking for some chili to go with the feast. Which may make us regret even more ordering another serving of rice (haha!) But our preference is for that sauce to have some fire to it. As Miggy explains, dishes from Zamboanga or the Tausug people are not spicy, contrary to common perception. In fact don’t be surprised if most of the dishes at Palm Grill will be a tad sweeter than what you are accustomed to, typical of other coconut milk based dished from the Bicol region or neighboring Thailand. Dessert also gets a Mindanaoan twist here at Palm Grill. 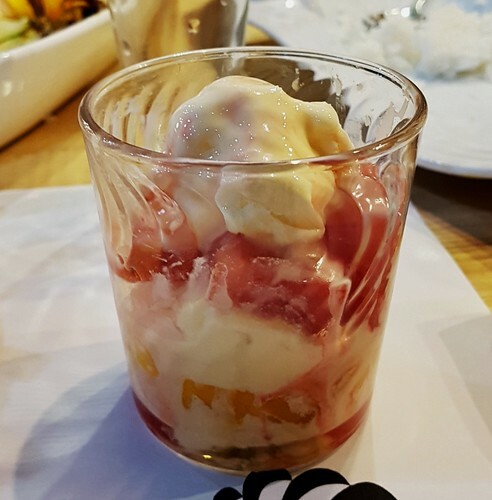 Think fruity halo-halo sans the ice: chilled watermelon, mangoes, banana, coconut jelly (nata de coco) drizzled with a special cream sauce, topped with vanilla ice cream. That is the Knickerbocker treat which originated from Zamboanga. Such a refreshing treat as if dinner was not decadent enough. As they say, there is always room for dessert. We think this is the only dish where the golden sauce will not be needed until someone dares to try one day! Dessert was compliments of Miggy but they serve this on a full-on parfait glass which we reckon no one would want to be sharing because it’s that good. To those who are devotees of their chicken, come back for the fresh seafood. And for first timers, make a surf and turf combo and have a delightful seafood fiesta here at Palm Grill. If these pictures did not make your heart go skip a beat just yet, we bet it will once that sauce touches your lips for the first time. And no, we are not talking about your cholesterol levels shooting up!